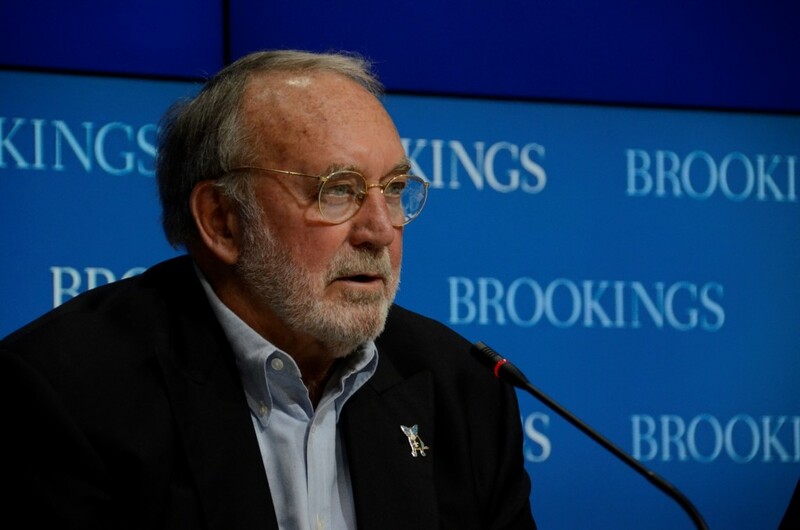 Journalist Ken Bode asks the audience at the Brookings Institution how much they know about the 2016 presidential candidates, just over two months before the Iowa caucuses. He questioned what impact platforms including Twitter and Facebook have had on how reporters cover political campaigns. SHFWire photo by Rebecca Anzel. The media has mentioned Donald Trump’s name 5,560 times in the past seven days. Ben Carson’s was mentioned 5,059 times. Hillary Clinton’s 2,257 mentions put her in fifth place behind Jeb Bush and Marco Rubio, according to The Atlantic’s daily dashboard. Newspapers, TV and radio stations and news websites have covered five Republican debates, two Democratic ones and countless rallies and speeches. And we’re still just over two months out from the Iowa caucuses. What we have not seen, heard or read much of, Ken Bode said Tuesday, is the sort of in-depth reporting typical of the work he did during his 40-year journalism career covering each presidential administration and election cycle since 1976. That question – how has new media influenced political coverage – addresses only a fraction of what I believe to be a more important one. How have our changing news consumption habits altered how we tell political stories? And is there a better way to do it? Study after study has shown millennials consume news differently from members of older generations. We read 140-character tweets, watch 30-second current-events videos and enjoy news comedy programs. We favor outlets that cater to our short attention spans and small screens. Bode reported on politics for NBC, PBS and CNN. He joined other journalists at a discussion at the Brookings Institution. He said that, in the past, reporters had time before the campaign season started to look into a candidate’s background and explain who the candidate was, what sort of an education he received, what his policies were and how he had performed in previous political stints. While informative and insightful, this form of journalism is not necessarily something people in my generation will read in its entirety. And neither, it seems, will younger people read daily political coverage produced by traditional media organizations. A recent discussion with my roommates, all 20-somethings, revealed we find those reports a bit intimidating. Unless we keep up with the topic or subject, the stories do not provide enough context to completely understand the importance of what is being written about. As a journalist and a millennial, I think about this quite a bit. How can I do my job informing an audience of my peers in a meaningful way about an election that will name our country’s next leader? Dave Meslin, a Canadian self-proclaimed community choreographer, gave a TED talk about political apathy. I think he makes an interesting suggestion. When a reporter writes a review of a play, he includes where the theater is, when the show is playing, what the price range is for tickets and perhaps the play’s website. Similar information is published with movie and restaurant reviews. So why, Meslin asks, do journalists not include this sort of information when covering politics? Why are campaign websites, debate information and political office locations not printed or linked to in online news sites? I think the short answer is that, as reporters, we are concerned about maintaining our independence. But I wonder if perhaps a politician’s Twitter handle and email address at the bottom of a relevant story might increase engagement and, by proxy, investment by millennials in political issues. Would this strategy be effective? Maybe. Matt Anzur, an investigative photographer for the Scripps Washington Bureau, said it might, but not until a pool of presidential candidates is narrowed to maybe two or three – 18 candidates is a lot for people of any age to pay complete attention to. I think it’s worth a try. If a politician’s social media accounts were printed at the end of an article with a note inviting a reader to contact the candidate for more information or to ask a question, I think engagement might increase. Investment and education in those matters would follow – if I saw my friends tweeting at a candidate or posting on a candidate’s wall, I would be curious about the buzz. Maybe we should experiment with this idea at the college media level – that’s where a lot of other interesting industry practices are happening (like this one). Stories of a manageable length, plenty of links leading to helpful context and a candidate’s social media accounts published on a college newspaper’s website might be a step in the right direction.